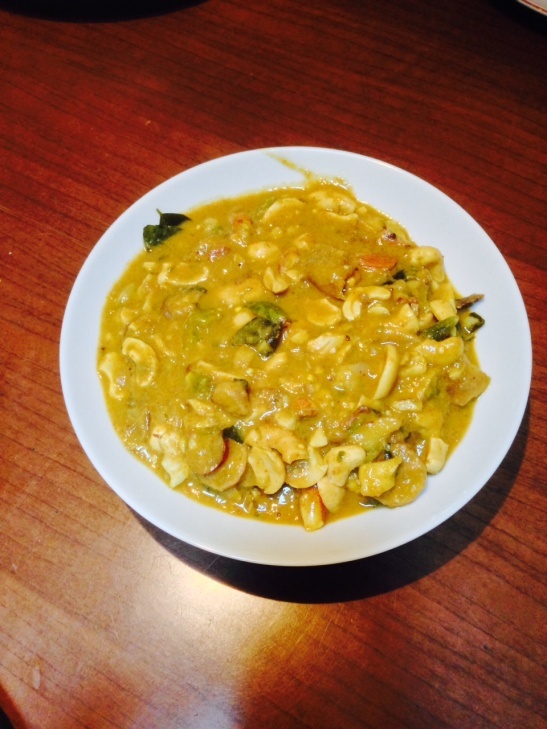 The recipe I would like to share today is my mother’s recipe for karunai kilangu/ elephant yam curry. I also felt like sharing some music clips. Today is the birthday of Ilayaraaja, one of South India’s famous movie soundtrack composers, who has composed music for more than 1000 movies (around 4500 songs). His debut in South Indian cinema was in the 70s and while he continues his work to this day, I think the peak in his musical career was in the 80s. Having grown up watching a lot of South Indian movies, I felt like sharing three of my favourite Ilayaraaja compositions in honour of his 71st birthday. The first song is from one of my all-time favourite movies Salangai Oli (translation: the sound of a dancer’s ankle bells, 1983), the Tamil dubbed version of the Telugu movie Sagara Sangamam. The movie has a Bharathanatyam theme and has a great cast including one of India’s best actors, Kamal Haasan (featured in the song). The movie won the Indian national award for best music direction and best male playback singer (S.P.Balasubrahmanyam). The second song is from one of my mother’s favourite movies, renowned director K.Balachander’s movie Sindhu Bhairavi (1985). This movie’s story has a Carnatic music theme running through and a great soundtrack which again won Ilayaraaja the Indian national award for best music direction. The movie also won the best actress award (Suhasini Maniratnam, featured in the song) and the best female playback singer award (K.S.Chitra who made her Tamil movie music debut through this song) for the song shared here. This song is a fusion of folk and Carnatic music. The third song that I am sharing here is a song from Maniratnam’s movie Thalapathi (1991). It’s simply a lovely short song. Boil the yam for about 15 mins. Then, roughly chop into smaller pieces. Lightly fry the chopped brinjal and yam. Keep aside. In a pan, add a tablespoon of oil and lightly fry the chopped onion and fenugreek for a few minutes. Add the lightly fried brinjal and yam to the pan. Add the tamarind and milk to the pan together with curry powder and salt to taste. Cook the curry for about 15 mins and then remove from heat. Today’s guest blogger is renowned independent film-maker Asoka Handagama. His movies have garnered much critical acclaim and have been screened at numerous major international film festivals (Toronto, Edinburgh, Tokyo etc.) around the world. His most recent movie ‘Ini, Avan’ had its world premiere at the ACID programme in the Cannes festival in 2012. Asoka is currently working on his newest film project which he plans to partially fund through crowd-funding. If you would like to participate in Sri Lanka’s first partially crowd-funded movie production, do check out the film’s Crimso page. Today, Asoka shares his favourite dish, Hathmalu – a specialty dish made during the Sri Lankan New Year/ Avurudhu/ Puthaandu. 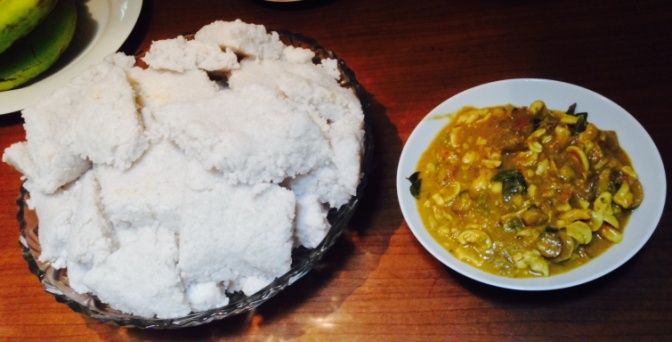 This traditional curry dish is prepared for an auspicious AVURUDU meal; popular in Sabaragamuva province in Sri Lanka. 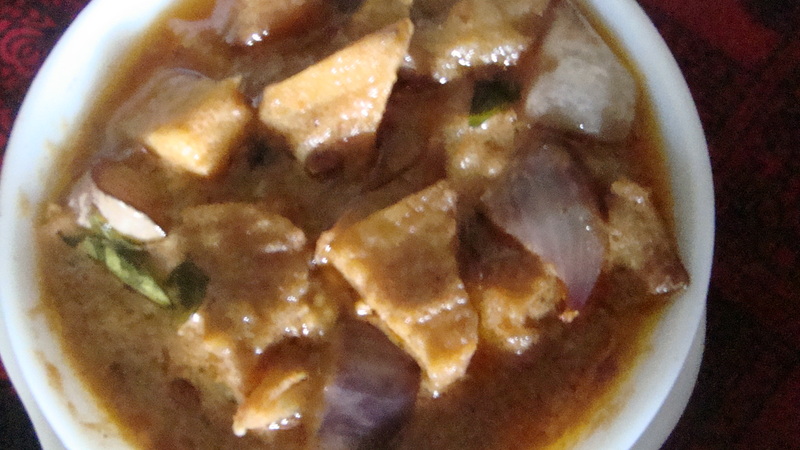 Uniqueness in this dish is that it is not prepared for any other occasion than AVURUDU. It is so yummy that you can swallow a whole load of milk-rice in a few seconds! Chop aubergines and other vegetables and potatoes into 1cm x 1cm x 1cm cubes. Add the seven main ingredients along with salt, spice mix, curry leaves, chili powder, red onions, green chili, turmeric and diluted coconut milk to a (preferably) clay pot. Place on stove and allow to cook slowly on low heat until all ingredients have cooked and softened (15-20 minutes). Then add thick coconut milk and (on medium heat) allow to simmer until the curry thickens and take it off the heat. 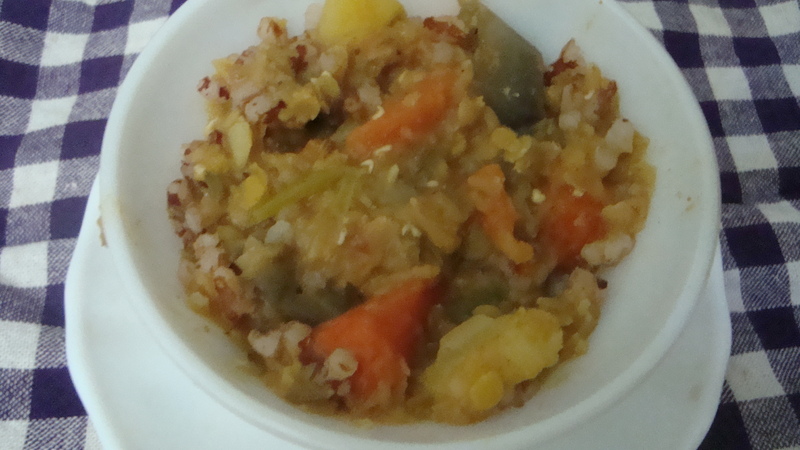 Serve curry with milk rice. During my online search for blogs with a focus on Sri Lankan recipes, I came across Rice and Curry. I invited the author to share one of his recipes on this blog and he kindly agreed. So today’s guest blogger is Skiz Fernando and he will be sharing one of his favourite vegan recipes. As a second-generation Sri Lankan-American, one of my main connections to the Motherland has been food. My mother used to make us rice & curry a couple of times a week, and we also used to get it at the various dinner parties thrown by the small community of Sri Lankans living in Baltimore, Maryland, where I grew up. Aside from cutlets and patties, which are any Sri Lankan kids’ favorites, I also developed a special affinity for brinjal curry. Since these dinner parties were usually ‘pot-luck,’ with everyone contributing a dish, I came to discover that the same lady was always responsible for bringing the brinjals, and that lady was none other than Aunty Manel. All the Sri Lankan ladies living in Baltimore were great cooks, so it just goes to show how special Aunty Manel’s brinjal curry was by the fact that it returned by popular demand to table after table, and dinner party after dinner party. I was not even really into vegetables at the time, but these brinjals were too sublime and tasty to be vegetables. It probably helped that they were deep-fried–as anything deep-fried tastes good–but it wasn’t obvious to me at the time. Only years later when I bugged Aunty Manel for the recipe, did I realize how labor-intensive this dish actually was, as you had to deep fry the eggplant before sautéing it with spices and coconut milk. Today, even though I have the recipe, the dish is challenging, but still worth the time and effort. Speaking as one who never liked eggplant, I always tell people that this is going to be their favorite way to eat the vegetable from now on. 1.) Wash and cut eggplant into 2 in (5 cm) strips. Rub with salt and a dash of turmeric. 2.) Deep fry eggplant until golden brown. Drain on newspaper. 3.) Blend (A) list ingredients in a food processor. 4.) Heat oil in pan. Sauté onions, green chilies, and curry leaves until onions are translucent. Add cinnamon, cloves, and dry spices. 5.) Add (A) and bring to a boil. 6.) Reduce heat and add eggplant, coconut milk and salt. Toss well and simmer for 3-5 minutes. Journalist, musician, and filmmaker, Skiz Fernando is the author of Rice and Curry: Sri Lankan Home Cooking (Hippocrene Books, 2011), a New York Times notable cookbook. He guided TV host Anthony Bourdain on a culinary tour of Sri Lanka for an episode of the popular Travel Channel series, No Reservations with Anthony Bourdain. Fernando blogs about spicy food at: www.riceandcurry.wordpress.com. He also markets his own home-made spice blends, Skiz’s Original Sri Lankan Raw & Roasted Curry Powders. Fernando is the host and producer of a popular YouTube cooking show, Pan Asian.